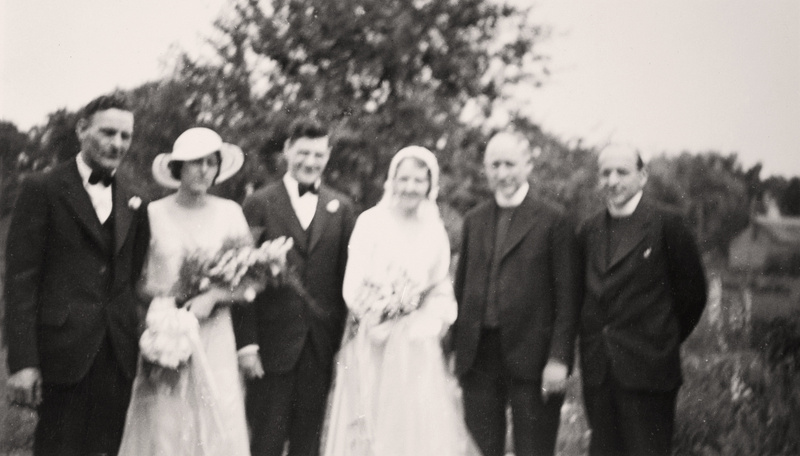 The wedding of Frederick William Selker and Eleanor E. Herman was held 19 June 1933 in Clarion, Clarion County, Pennsylvania at the Immaculate Conception Church. Frederick William Selker was born 15 October 1896 in Clarion, Clarion County, Pennsylvania. He was the son of Joseph William Selker and Frances Philomena Guth. Eleanor E. Herman was born 13 February 1910 in Clarion, Clarion County, Pennsylvania. Recently I had the opportunity to connect with some more Selker Cousins. 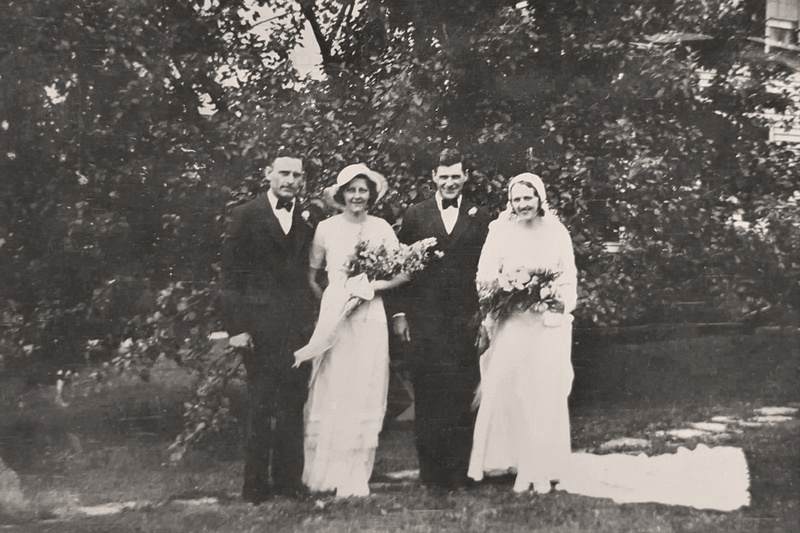 The cousin, a descendant of Frederick William Selker and the Eleanor E. Herman, had a labeled copy of the wedding photograph below. Using the known photograph from the wedding the photograph below was identified. The photograph was previously housed in the Unknown Photograph Collection. In addition to identifying the unknown wedding party - these are the first known photographs to exist of Ambrose John Selker. Frederick William Selker (Groom), Eleanor E. Herman (Bride) Unknown Clergy, Unknown Clergy. The top photograph is from the Frederick William Selker Collection. Photographs in this collection were originally owned by the sisters Naomi Herman and Eleanor E. Herman. Today these photographs are in the care of a descendant of Frederick William Selker and Eleanor E. Herman. The photograph is shared with permission. Photographer Unknown. Editing and digital restoration by Michelle M. Murosky. The bottom photograph is from Frances Philomena Selker Collection. Frances Philomena Guth appears to have passed the photographs down to her daughter Frances Philomena Selker. Frances' daughter Mary Eugina McDonald ended up with her mother's photo collections which is time were handed down to me. Photographer Unknown. Editing and digital restoration by Michelle M. Murosky.